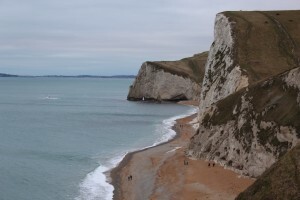 Location: Durdle Door is just west of West Lulworth on the B3070. It’s an interesting journey as you pass through land owned by the MOD, and there are places where it is necessary to check if the firing ranges are in use! 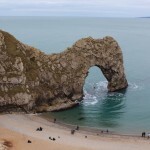 Durdle Door is a natural arch made from Portland Stone, a type of limestone. The bay in which it sits has five different geological deposits, including Wealden clay and sandstone. 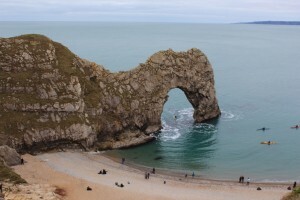 The arch has been eroded by the action of the sea, and the natural arch created gives pleasantly choppy water for canoeists to navigate. It is a popular tourist spot of outstanding natural beauty. To the West, along the beach, is the beginning of a second arch. 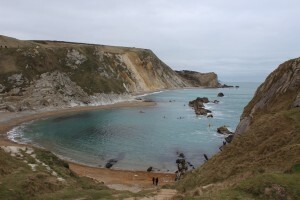 On the approach to Durdle Door, on the East side, you pass Man-o-war Bay, a stunning basin with sheltered water. Once again, this is a popular destination for canoeists. The cliffs are deceptively high, and it is necessary to be cautious as for the most part they are not fenced off, so a long drop could await the unwary. There are steps down to the beach that are well-maintained, although it is advisable to take care, and the steps are not suitable for those with joint problems. The pathway down to the steps is also very steep, a 45% angle, and again poses problems for those with joint issues. The return climb to the car park is strenuous. The entire site is not easily wheelchair accessible, and there are no facilities for wheelchair users.